Bible chronology at the Flood, with bible prophecy numbers. and the (LXX, SP) '215' years of Gal. 3:17, a total possible span of 405 years. Steven says that Abraham left Haran "after the death of his father." The OT does not tell us this directly, however. This adds an extra 60 years to the flood date because Genesis 11:26 says Abram was born when his father, Terah, was "70 years old" and that at "75 years," Abram left Haran and entered Canaan. This would make Terah 145 years old at the time of Abram’s entry into Canaan (70 + 75 = 145). However, since Genesis 11:32 says that Terah died at 205 years, it follows that Terah must have been 130 and not 70 years (according to NT) at the time of Abram’s birth (130 + 75 = 205), contradicting Genesis 11:26. Why this discrepancy? Notice that Genesis 11:10 says that Shem’s son was born "2 years after the flood." Therefore, since Noah was exactly 600 years at the flood, and hence 602 years old at the birth of Arphaxad, it follows that Noah was 502 years old at Shem’s birth and not '500' as it says in Genesis 5:32. Consequently, we have the same phenomenon repeated here with Noah as we did with Terah who was 130 years old at Abram's birth and not '70' as the text says, Genesis 11:26. The LXX adds an extra name "Cainan," to the chronology between the flood and the birth of Abram thus effecting the date of the flood. If we include it, we must add another 130 years. Furthermore, the gospel of Luke uses this same LXX reading by listing 'Cainan' in his genealogy (Luke 3:36), consequently adding considerable weight to an otherwise weak reason for including this 130 years. 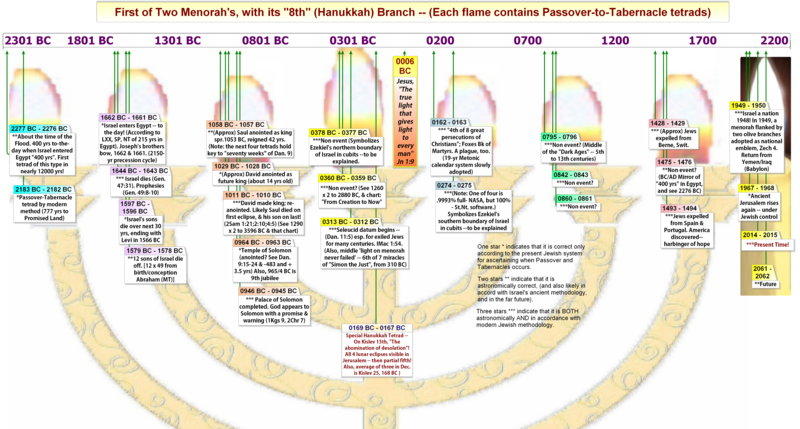 The three genealogical NT variants produce a possibility of 8 different dates for the flood and for the creation. Which of them do we use? There are three sensible ways of solving this problem. 1.) Accept all 8 dates as is. 2.) Follow the two lines of authorities ('MT;' or, 'MT' with 'LXX and NT') and take your choice (or use both). 3.) Use the maximum and minimum possible dates and produce two creation and flood dates. Personally, I favor the third option because it takes into consideration both lines of authority while retaining simplicity, and because the total gap of 405 years proves self-evident in two ways: By the patterns it produces, and secondly, as an interlocking meaningful Bible number in and of itself. I rarely work with the other options. However, to show that all three choices are valid (but with preference to the third), we will sample all three categories now ---for all '8' dates have the same simple pattern! Next, the "Chronology of the Creation"
This powerful video is less than one minute long! Please share it!